are provided for every purpose. Fig. 1. Sew -hp- 201C, 200] and 202C Audio Oscillators take up only half the bench space oj their predecessors. Two of these oscillators use the new type of R-C oscillator circuit described m article starting on pg. 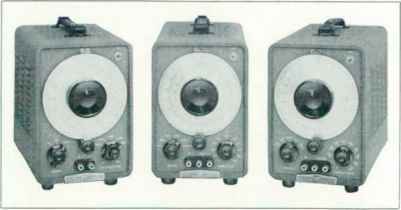 4.
ing of the frequency dials. Rotary switches use bar type knobs for ease of switching. The new Model 201C oscillator at the left in Fig. I is designed for testing higher-quality audio systems. * The instrument operates over the range from 20 cps to 20 kc and provides a maximum of 3 watts into a 600-ohm load. Distortion in the output is less than 0.5% at levels below 1 wart and less than \% at levels up to 3 watts. • [rf highest quality iyi'.cm* consideration should ■lw b< Signal ajw be piven to the supetljtive hp- :06A Audio Generator. PRtNTCO IN U.S.A. COPYRIGHT 1SSS HEW LETT -PACKARD CO. Fig. 2. Basic output circuit arrangement of Model 201C oscillator. Six-hundred ohm source impedance is obtained with output attenuator set for 20 db or more. Amplitude control permits continuous adjustment of output level. output power is adjusted by an amplitude control located at the amplifier input (Fig. 2). The output attenuator itself is provided with four 10 db steps (five attenuator switch positions). When 20 db or more of attenuation is inserted with the attenuator, the source impedance of the instrument is a close match to 600 ohms. Desired power levels which may lie between the 10 db attenuator steps can be selected with the amplitude control, This arrangement thus provides both a 600-ohm source and selection of any desired output from zero to 0.03 watt while keeping noise at a relatively fixed level below the output signal. The amplitude and output attenuator controls, although located in different parts of the circuit, are made physically concentric in order to facilitate selection of the desired output level. The new Model 201C supersedes the former -hp-Model 20 IB which has been discontinued. There are many applications where an oscillator with a large number of calibrated points on its frequency dial is required. 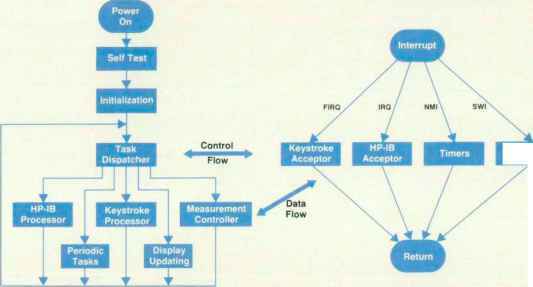 Most of these applications deal with frequency measurement work. A typical situation, for example, is indicated in Fig. 3 where the difference frequency betwreen two higher frequencies is to be measured by means of lissajous patterns on an oscilloscope, By connecting the 6 cps-6 kc spread-band oscillator shown at the center in Fig, 1 to the appropriate set of deflecting-plates on the oscilloscope, the difference frequency can be measured accurately within ± 1%. This 1% tolerance represents an insignificant error on the overall measurement in most instances, since it applies only to the difference frequency and this is usually a small percentage of the main frequency being measured. The frequency dial of the spread-band oscillator is reproduced in Fig. 4. The high order of definition of the frequency calibrations on this dial is evident. To aid in obtaining this definition, the frequency spread of each range of the instrument has been made 3.3:1 instead of the 10:1 which is usual in -hp- oscillators. Fig. 4. Frequency dial of 200] 6 cps -6 kc oscillator. 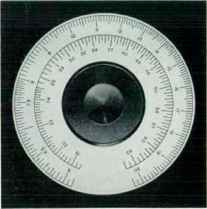 Large number of calibrated dial points simplifies frequency measurement work. Model 200J are accurate within ±1%. A special feature of the instrument, however, is that it is arranged with standardizing controls in the form of screwdriver-operated internal adjustments which can be used to maintain the long-time accuracy of the frequency dial. If desired, these controls can also be used to obtain optimum accuracy over any desired portion of the dial that might be especially useful for a particular type of measurement. The output circuit of the Model 200J is designed to provide 10 volts to an external load of 600 ohms. The internal impedance of the circuit is also 600 ohms so that as much as 20 volts is available open circuit. The output system is arranged in the same way as that of the -hp- 202C which is described later. The new Model 200J supersedes the former -hp- Model 2001. The latter has been discontinued. The instrument at the right in Fig. I is designed with a very wide frequency range—from 1 cps to 100 kc. Tills wide range enables the instrument to be used for a wide variety of purposes throughout the sub-audio, audio and ultrasonic ranges, but design emphasis has been placed on making the instrument especially suitable for low-frequency purposes. The instrument is thus especially suitable for such purposes as a frequency source for vibration studies and for testing servo, medical and geological survey equipment. To achieve a high order of performance at low frequencies, the instrument uses a special type of R-C oscillator circuit which is described in a separate article in this issue. The instrument will provide a maximum output of 10 volts across a load of 600 ohms or 20 volts open circuit. The frequency output is stable within ±2% under usual operating conditions. The stability tolerance includes warm-up drift, calibration error and reasonable aging of components. Distortion in the output is less than 0.5% above 10 cps and, becausc of the special design of the circuit, is not influenced by any load impedance from open circuit to short circuit. The output transformers are balanced within 0.1% at the lower frequencies and the instrument is arranged so that it can be used as a balanced source if desired. The output power is controlled by an unbalanced bridged-T attenuator made up of variable controls. This attenuator is arranged, however, so that at full output the series arms short and the shunt arm opens, thus removing the attenuator from the circuit. Under this condition the output terminals see the internal impedance of the system which has been made equal to 600 ohms. The system can thus be used as a balanced 600-ohm source if desired, in addition, either of the output terminals can be grounded. A special convenience of the instrument is that the circuit recovery time after switching ranges is less than 5 seconds even at the lowest frequencies that the instrument generates. FREQUENCE RANGE-. 20 cps to 20 kc in three ranges. CALIBRATION ACCURACY; ±1%. Calibration controls provided for standardising bands. FREQUENCY STABILITY: ±2% or 0.2 cps (whichever is greater) under narmat temperature condition) and Including initial warmup, aging of component!, etc. OUTPUT: 3 wotti mo*, or 42.S volt! into £00 ohm load. One terminal ot ground potential. 50 volts maximum no-load voltage. ATTENUATOR: 0-40 db in 10 db steps-concentric amplitude control varies out. put continuously zero to maximum ot any attenuator setting. INTERNAL IMPEDANCE: Appro*, 75 ohms below 5,000 cps at zero setting of attenuator, Appro*. 600 ohms entire frequency range with output attenuator at 10 db or mare. POWER: 115/230 volts ±10%, 50/1,000 cps, approx. 75 watts. DIMENSIONS: Cobinet Mount—7W wide, 11W" high, 12^" deep. Rock Mount-1?" wide, 7" high, 12" deep. WEIGHT: Cobinet Mount—16 lbs. ; shipping weight opprox. 23 lbs. Rock Mount—18 lbs. ; shipping weight opprox. 35 lbs. PRICE: -hp- Model 20IC Audio Oscillator, Cabinet Mount, $225 00. -hp- Model 201CR Audio Oscillator, Rack Mount, 1230.00. FREQUENCY RANGE: 6 cps to 4,000 cps. DIAl CALIBRATION: 2 bands. A: 6 to 20; B: 20 to 60. CALIE RATION ACCURACY-. ±1%. Callbration controls provided for standardizing bands. FREQUENCY STABILITY: ±2% or 0.2 cps (whichever is greater) under normal temperature conditions and Including initial warmup, aging of components, etc. FREQUENCY RESPONSE. ±1 db entire frequency range (reference 1 kc). OUTPUT: 160 milliwatts into 600 ohm rated load, or 10 volts. 20 volts open circuit. DISTORTION; less than 0.5% entire frequency range. Independent of load impedance. HUM VOLTAGE; Less than 0.1% of rated output. Decreases as output Is attenuated. POWER; 115/230 volts, ±10%. 50/1,000 cps, approx. 110 watts. WEIGHT; Cabinet Mount—23 lbs. ; shipping weight appro*. 29 lbs. Rack Mount— 25 lbs. ; shipping weight approx. 42 lbs. PRICE: -hp- Model 200J Audio Oscillator, Cabinet Mount, 6 cps 6 kc, $275,00. -hp Model 200JR Audio Oscillator, Rack Mount, 6 cps 6 kc, $280.00. FREQUENCY RANGE.- 1 cps to 100 kc In five ranges. ACCURACY: ±2% under normal ambient temperature conditions, including calibration error, warmup, changes due to aging of components, tubes, etc. FREQUENCY RESPONSE: ±1 db entire frequency range (reference 1 kc). DISTORT/ON; Less than 0.5% obove 10 cps. Independent of load impedance. Less than 3% ot 1 eps. RECOVERY TIME: Less thon 5 seconds at 1 cps. POWER SUPPLY: 115/230 volts, ±10%, 50/1,000 cps, approximately 110 watts. DIMENSIONS: Cabinet Mount-7'A" wide, 11%" high, 13V deep. Rack Mount-1?" wide, 7" high, 14',i" deep. WEIGHT; Cabinet Mount—27 lbs,; shipping weight appro*. 34 lbs. Rack Mount— 29 lbs. ; shipping weight opprox. 44 Ibs. All prices f.a.b. Palo Alto, California, Data subject to change without notice.